So what happens when a child experiences early traumatic events? The impact of adverse childhood experiences can often create toxic stresses that affect a young person’s development and learning. Their brains often become wired to function on survival mode; and often they resort to flight or fight tactics. Traumatic experiences can impact children’s moods, their social and emotional development and their ability to regulate their emotions. They may have developed coping skills to help them survive the repeated trauma that later become mal-adaptive and isolate the children as they grow. They become broken and tossed aside by those close to them, who are often the cause of their neglect, physical, psychological or sexual abuse. Having lost their childhood, they often lose their self-respect, self-worth, self-confidence and they also lose their willingness to trust adults. At OMID, we cannot underestimate the significance of having at least one stable adult who cares and connects to the young women in our care. Healing begins in secure relationships and through meaningful connections. Omid staff members need to go through extensive trauma-informed training in order to learn how to adapt their expectations, behaviours and communication style to meet the needs of the young women in their care. Within the right framework, a trauma-informed framework, staff members can become safe adults and role models that can help the girls regain trust; increase their resilience and gain the skills they need to rebuild their lives. The OMID center offers a safe place for them to grow, learn and develop into adults who have the potential to achieve what they want in life with renewed hope. 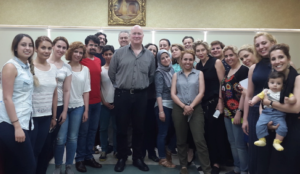 To this end, OMID social workers, psychologists, educational advisers and members of the management team have all participated and will be participating in a series of important training sessions in Dubai. The first of these sessions was a training course in Resource Based Therapies (RBT). Course leader Dr. Paul Grantham (above center), a member of British Psychology Association, took the OMID team through a course covering Motivational Interviewing, Solution-Focused Brief Therapy (which is a sort of a short-term therapy technique focusing not on the underlying problem, but rather on finding solutions) and positive psychology and its practical therapeutic applications. The next course was an introduction to Dialectical Behavior Therapy (DBT) also lead by Dr. Paul Grantham. This course being an overview, before a 4-day intensive course, which is part of a series of 3 modules that will lead the team to each qualify with a certificate in DBT. DBT is a cognitive-behavioral psychotherapy technique that was first developed for patients with Borderline Personality Disorders (BPD), however it is now widely and commonly used for behavioural treatments such as managing risky behaviours and emotional stabilisation. Brief introduction to individual therapy techniques used in DBT. This was where all participants were given an assignment to complete upon return to Tehran: to record a video using validation techniques with clients at OMID. Over the next few months, we will be updating you with more information about the intensives and module based stages that OMID is undertaking as part of the series of important steps to developing it’s trauma-informed culture.